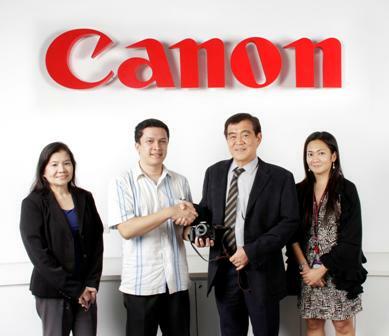 Canon President and CEO Alan Chng hands over camera to Raph Torralba, hard of hearing member of “Visual Shot Club”, a group of deaf photographers, who recently teamed up with Canon and SM Supermalls on the “Photography with a Difference”. Mr. Torralba, Resource Coordinator of the Institute of Health and Wellness Philippines, will compete in the “8th International Abilympics” Photography Contest, Seoul, Korea on September 25-30, 2011. 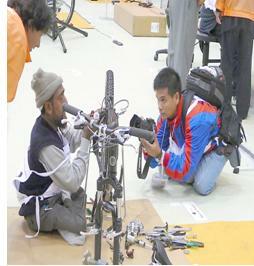 Canon shared willingness to provide the official camera for future International Abilympics Photography competitors. Leading the Philippine team to Korea is Abilympics Philippines Chairperson Mons T. Romulo. NCDA-TCD Chief Nelia R. de Jesus (extreme left) and Canon’s Corporate Communications Manager Margie Escueta, (extreme right), witnessed the July 6 turnover. Ms. Escueta shows President Chng the NCDA Magazine “Journey Beyond disABILITY” featuring Cebu deaf lensman Alnoe Paler, another “Abilympics national champion” – recipient of a Canon camera, who she personally assisted way back 2007. I am glad about Raph, which he got to be represented to the ALYMPICS …He is my friend. As the thought of his position, I expect for the correction – member of the Visual Shot Club instead a president and project coordinator with other PWD on photography. I hope this responsibility should be changed sooner.. thank you! !